Day of Battle II is a miniature game that places you in the role of a great Warlord of the feudal era. Through these rules and with the help of the eight early feudal domain lists within you will be able to raise and command your own army. The highest born knight, the uncertain mercenary, and the humblest peasant levy will all serve you in your cause, for it is just and right. 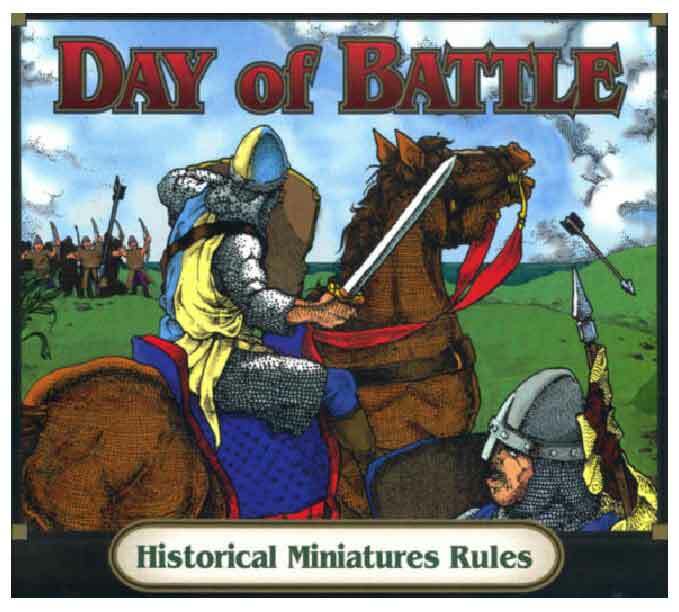 Day Of Battle II continues with its ground breaking rules systems and introduces even more. Proximity Movement allows for realistic battlefied movement based on how near units are to one another. Harassing Morale allows each player to decide when his opponent is at his weakest and force him to check his morale, keeping the obvious morale checks to the barest minimum. Warlord Motivation and Honor Points breath life and reason for fighting into your character. Campaign Stance allows you to fight an opponent while outnumbered and still claim a victory. Roleplay your Warlord correctly based on his Motivation in life and watch him rise above his peers to become an Earl, Duke or even a King. Pdf version of the rules. Adobe Acrobat 5.0 or higher is required.